It was a moment when all the sacrifices and struggles of Vietnamese people, struggles waged against all odds, justly culminated in the Great Victory of Spring 1975. Playing no small part in the struggle were reporters of the Vietnam News Agency, who were "information soldiers" always on the frontlines of the resistance. Overcoming poor material and technical conditions, they fought to ensure that information and images were updated constantly, boosting the morale of the nation's armed forces as well as readers within the country and around the world. "Reporters of the Vietnam News Agency were present at every battlefront, with every marching troop," former President Le Duc Anh said at the agency's 50th anniversary on September 14, 1995. "It lost more than 260 journalists, 20 per cent of its staff then. It was a serious loss, yet at the same time a pride, a priceless contribution by the agency to the national cause of fighting for liberation and protecting its sovereignty." In the 1965-75 period, the agency sent hundreds journalists and technicians to the central and southern areas of the country. It was a time when each and every staff member, from leaders to cleaners, from editors, translators and reporters to technicians and drivers were aware they were contributing to the revolution. In the lead up to the historic victory, VNA journalists followed the liberation forces' advance from all directions on Sai Gon. Do Phuong, former general director of the agency, recalled that a special team led by the then general director Dao Tung was assigned to the south in mid-March 1975, after the liberation of Buon Ma Thuot, to report on the situation and support Thong Tan Xa Giai Phong (Liberation News Agency, the southern branch of Vietnam News Agency). "The team gathered experienced journalists like Tran Mai Hanh and Van Bao. Various teams of journalists and technicians were sent to central and southern regions, with the last team of journalists, Tran Mai Huong and Lam Hong Long, heading to the Hue battlefield," he said. "From mid-March to early May, 1975, the Southern News Desk and the Military News Desk published news almost non-stop," Phuong said. "We couldn't wait for the regular day-end publication but had to print the updated news immediately when we received breaking news from the front from our own reporters and photographers. Never before had the editors worked so busily and happily. Staff working at the office canteen, who were busy serving meals, were also longing for the latest news." Towards the end of April, 1975, the camping site of the Liberation News Agency in the Tay Ninh Forest (99km away from Sai Gon) was bustling with activity as the liberation troops rapidly advanced towards Sai Gon. Reporters and photographers were divided into groups to discuss topics and figure out marching ways on city maps to approach important enemy stations, and reach the Independence Palace at the earliest. Journalist Hanh, assigned to write the first report on the Victory Day, and photographer Bao took a Honda motorbike and headed for Sai Gon early on April 29. They reached the Independence Palace at around 11.45am on April 30, where a flag of the South Viet Nam Liberation Front was already flying. They met other journalists accompanying Infantry Division 304 and Tank Brigade 203, including Tran Mai Huong, Vu Tao, Ngoc Dan, Hoang Thiem and Dinh Quang Thanh. The photograph of a tank breaking through the palace gates taken by Huong has achieved iconic status, and is used widely as a symbol of the victory. Hanh then asked for important information for his report, including the time when the first tank burst through, and the flag was hoisted on top of the palace, and how the Sai Gon regime's President, Duong Van Minh, announced his surrender. Hanh then rushed to the second floor, where all members of the surrendered cabinet were seated. He asked for details of the conversation between Duong Van Minh and the leader of liberation troops, Captain Pham Xuan The. Later, Hanh and Bao went to the Nha Rong Wharf, from where President Ho Chi Minh had set out to foreign shores on a ship in 1920, seeking a way to liberate the whole nation. Hanh interviewed a worker at the port, recording his feelings about the President and his thoughts on the nation's liberation and reunification. Returning to a temporary office of the Vietnam News Agency, Hanh wrote a 1,200-word report titled "Thanh Pho Ho Chi Minh Ruc Ro Ten Vang" (City Shines in New Name Ho Chi Minh). The report was done at 2pm, but it was only late in the night, that it was sent to camping site of Liberation News Agency at Tay Ninh forest using Morse code, where it was sent to Ha Noi by a bigger capacity radio transmitter [than the one they had in City]. Vietnam News Agency published the report the same night as the first reportage on the historic moment, while other newspapers and radios recovered it the next day. 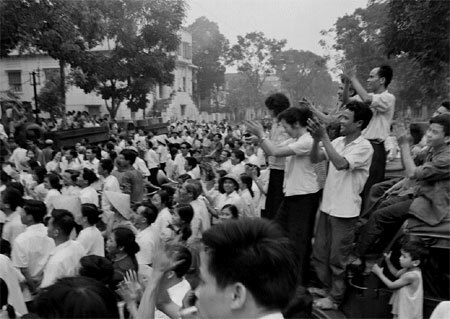 To this day, Hanh cannot forget the pride and happiness he felt as he listened to his report on the then Radio Voice of Viet Nam, sitting in a car with Bao in the middle of the bustling city with streams of people pouring on to the streets to welcome the liberation troops. "I could not stop the tears," he said. "Can there be a more emotional and happy moment in a journalist's life? I thought of my boss who'd sent me to the front, of people who helped me conduct interviews at the site, of the dozens of technicians who had hurried to send my report home without a single minute of rest after the long journey [to Sai Gon]. Though I signed my name, the report was made by many people…"
Photo journalist Kiem, who had been on the site of many fierce battles, including the ones in Vinh Linh and Con Co, joined the Ho Chi Minh Campaign to liberate Sai Gon and witnessed victory at noon on April 30. Kiem also worked as a military official of the Democratic Republic of Viet Nam, witnessing the withdrawal of American troops from southern Viet Nam and the exchange of prisoners at David Camp in Tan Son Nhat Airport in 1973 after the Paris Agreement was signed. Kiem said he saw the affection of Sai Gon's residents in their eyes when he and his colleague in the uniforms of the army of the Democratic Republic of Viet Nam crossed streets, escorted by the Sai Gon army. "Though we did not say anything to each other, I felt the love of Sai Gon's residents for us. "That affection seemed to break out on April 30, when locals poured into the streets to receive the liberation troops," he said. "They brought cookies and cigarettes and other things as gifts. My colleague, Dinh Quang Thanh, jumped off from our car to take close-up shots of the people. They put gifts in Thanh's pockets as he was holding a camera and could not take anything with his hands. "I took a photo of Thanh in the middle of the crowd, which I think captures the most vivid expression of the southern people's desire for peace," Kiem said. Reflecting on that time, he said: "I think I'm much luckier than other people to have had the chance to 'fight' with my camera during the war, not get injured and be able to witness the final moments of the war," he said. While the journalists on the battlefront compiled unforgettable memories, their colleagues at Vietnam News Agency's headquarters in Ha Noi also burned the midnight candle over battle bulletins. The Southern News Desk, set up in 1960, successfully fulfilled its historic mission for 15 years. The department's main tasks included editing all pieces of news and reportage by VNA reporters and other international news agencies on the fighting and lives of people residing south of the 17th Parallel. By 1973, the department had 30 staff members, most of whom had worked in the central region, like Vo The Ai, Nghiem Thi Tu, Tran Mai Hanh and Dinh Trong Quyen. "In the two years 1973 and 1974, the bulletin covered the most interesting stories. It offered updates on battles, the movements of southern people in rural and urban areas, stories on soldiers returning to the north from the south as well as revolutionary soldiers released from American prisons," said Nguyen Thu Huong, a former editor of the department. Ai, former head of the department, said that in early 1975, many of the department journalists were sent to the south. There were only ten people working at Ha Noi office. They used to stay overnight at the office to update the bulletin. On Lunar New Year 1975, President Ton Duc Thang sent a bunch of flowers to the department, complimenting the staff on fulfilling their missions. "I have to confirm that all the first reports and photos we got on the historic day April 30, 1975 were sent to Ha Noi by our reporters," Phuong said. "I myself updated the battle news everyday to Party and the State leaders, who told me that the Vietnam News Agency should burst firecrackers when we received the news of total victory, as a way to inform the residents of Ha Noi. No staff member of the Southern News Desk will ever forget the moment they heard the President of the Sai Gon regime, Duong Van Minh, announced an unconditional surrender at midday, April 30, 1975. At that time, the door and windows of the room with the phone desk were open wide. The volume of the radio was turned on maximum so that everyone could hear Minh's voice. A string of firecrackers was hung from the office's 5th floor to the ground. It was set off and the happy sounds of victory echoed loudly. Thousands flocked to the Tao Dan Park in front of 5 Ly Thuong Kiet Street at the junction to today's Ly Thuong Kiet and Le Thanh Tong streets. "They stood on the backseat of their bicycles or jumped up on top of parked cars facing our office to hear the news with broad smiles," Huong recalled. "That night, the whole of Ha Noi could not sleep," she continued, "My colleague Dao Tuyet Mai and I joined the endless streams of people walking through downtown. "We walked from streets to streets, smiling and hugging strangers as if we were close friends. Everyone seemed on a high of endless happiness…"
"We are proud of our contributions, especially during the Ho Chi Minh Campaign that reunified the nation," said Phuong.